At House of Friendship, our vision is to create a healthy community where everyone can belong and thrive by supporting those who need food, housing, community resources or addiction treatment. House of Friendship was founded in 1939 in the aftermath of the economic depression with the goal of helping men on the streets who were fighting hunger and homelessness. It later expanded its services to now include all genders and ages for day treatment and related wrap-around support. With 200 staff members, 1,000 volunteers annually, and a large group of donors, HoF now serves over 42,000 men, women and children per year who are struggling with addiction, low income, or access to afforable housing across Waterloo Region. House of Friendship is raising $1 million in secured community bonds towards the Close to Home Addiction Treatment project, which will improve and increase the addiction treatment services provided by the organization in the Kitchener-Waterloo region. This financing will help House of Friendship meet the rising need of the community brought on by the current opioid crisis. The community bonds are structured as debt securities with a 6 year term and 4% interest paid annually, and principal repayment at the end of the term. Structure: This offering is structured as secured community bonds with a 6 year term and 4% interest rate, with annual interest payments and principal repayment at the end of the term. Use of Proceeds: House of Friendship's community bonds will partly finance the Close to Home Addiction Treatment project. The project aims to improve and increase the addiction treatment services offered in the Kitchener-Waterloo region. Please note that this is not a complete investment summary. Investors should read all associated documentation before considering or making any investment. Counselling Services: HoF provides family, individual and group counselling services, as well as specialized service for pregnant women and women parenting young children. Additionally, House of Friendship is now providing family, addiction and problem gambling counselling, formerly offered by St. Mary’s Counselling Services. Day Treatment:HoF provides workshops and sessions where community members learn valuable techniques to reach substance-use goals, in a supportive group environment. Some workshops and sessions are offered separately for women and men, while others are for all genders. Residential Treatment: This service includes support with identifying and addressing lifestyle issues in a safe, substance-free environment, as well as evidence-based group and individual therapy sessions to build on personal strengths. The length of this program varies 4-6 months. Community Addiction Support Services: In partnership with community organizations, HoF offers permanent and transitional supportive housing, a walk-in Rapid Access Addiction Clinic, and community withdrawal support services. House of Friendship offers emergency food hampers throughout the year for individuals and families in need, as well as Christmas food hampers and turkeys in December. Charles Street Men's Shelter: This is a HoF operated emergency shelter for men aged 16 years or older who have no current address. Staff at the shelter provide support to help men experiencing homelessness move into permanent housing as soon as possible. Supportive Housing: HoF offers affordable permanent housing at Charles Village, Cramer House and Eby Village for those living on low income who may have experienced homelessness. The program includes on-site supports to maintain independent living. House of Friendship offers its community a range of services including community centers, summer camp sponsorships, and family outreach programs (supporting parents to prevent and reduce child poverty). 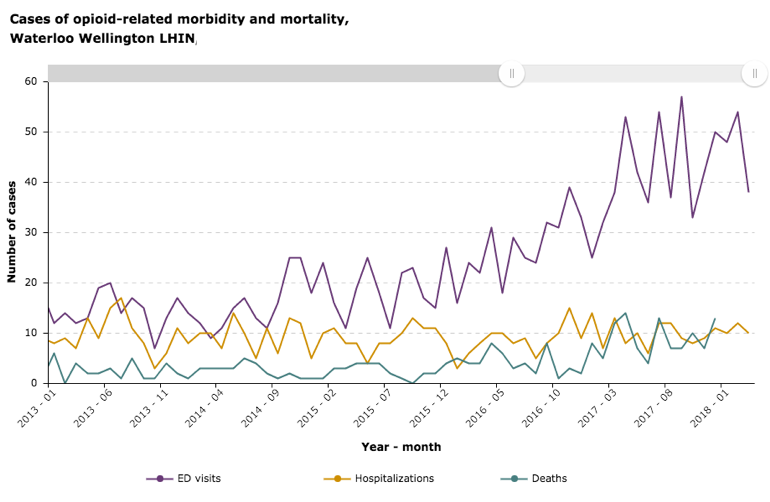 In Ontario, emergency department visits related to heroin poisoning increased by almost four times, while visits for synthetic narcotic poisonings more than doubled in the last five years (2013 – 2018). 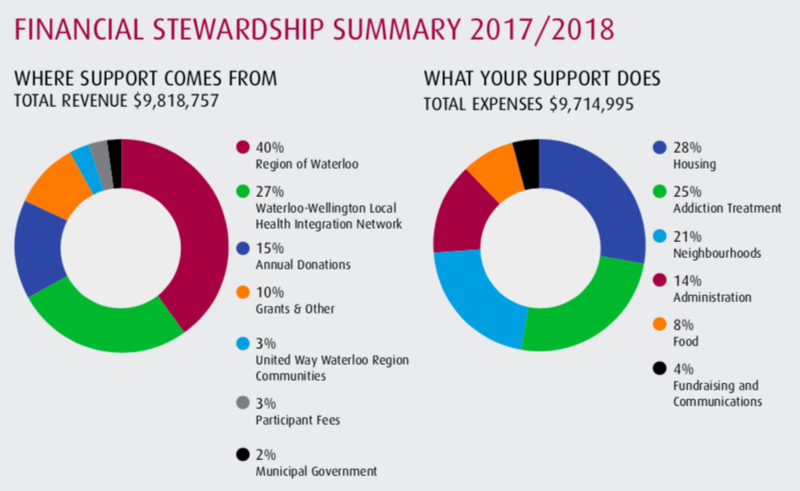 The Waterloo Wellington LHIN has seen a similar trend in the geography directly served by House of Friendship . House of Friendship’s Close to Home addiction treatment project aims to improve the addiction treatment services offered in the Kitchener-Waterloo region. HoF purchased the property at 562 Concession St. to replace the facility at 174 King St, where HoF has been providing addiction services (residential and limited day treatment) since 1975. The residential treatment program provides a safe and private housing solution for men who will live there for up to 6 months, in a healing environment with the needed supports. House of Friendship has raised $2 million in philanthropic capital to renovate the 562 Concession St property and repurpose it in order to provide men’s residential addiction treatment in a place of greater dignity with expanded access and programming, as well as day treatment for adults. At the time of purchase, the opioid crisis had yet to reach its current and critical state, both within the region and our provincial/national communities at large. After experiencing the acceleration of the crisis, House of Friendship expanded the Close to Home Addiction Treatment project to include an additional $1 million in community bonds for the construction of a second floor for increased capacity with anticipated completion by summer 2019. 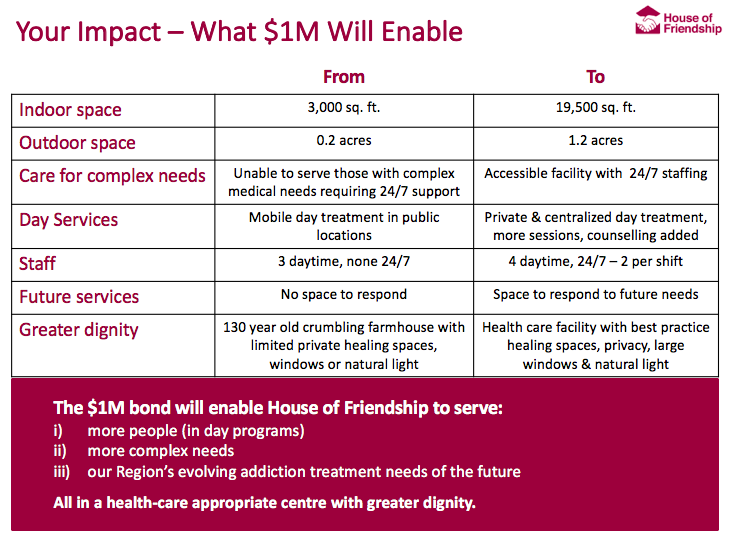 The image below shows the breakdown of financing for the Close to Home Addiction Treatment Project. House of Friendship serves more than 42,000 people in need every year. This includes over 850 individuals who seek addition treatment every year, and 400 individuals who participate in day treatment programs. Post Program: A weekly aftercare meeting is offered for those who have completed the program or those who have completed a program in the Local Health Integrated Network. House of Friendship has a long history of offering this proven program. Now, in the face of the opioid crisis worsening considerably, the organization has recognized the need to move into a new facility as soon as possible. Improvements at the new space will include increased staff ratio (previously limited by accommodation), physical accessibility, and follow up services and family services offered in the same building. In 2017 - 2018, House of Friendship served 50 people in the men’s residential program. However, there were 202 people referred and House of Friendship was unable to accommodate 50% of these individuals due to the physical space and staffing limitations, with similar turn away ratios in the years prior. Recognizing that this data is a call for improvement, ultimately the impact from this project is not about numbers in men’s residential treatment, rather about the who and how. The addition of the 2nd floor at 562 Concession St and the expanded access it provides means that those House of Friendship previously turned away (without somewhere else to send them for treatment) will now have treatment available. Treatment will also occur with much more dignity, as would be expected when bringing a loved one to a health care treatment facility. House of Friendship has a strong management team that is dedicated to serving the needs of the Waterloo region. Executive director, John Neufeld, has led HoF through a period of rapid growth over the last ten years. House of Friendship is also supported by a large group of volunteers and donors. On the financial side, House of Friendship has had a balanced budget for the last five years. The image below shows the breakdown of the organization's revenue and operating expenses for the 2017-2018 fiscal year. This is an illiquid investment, with investors receiving principal investment payout at the end of the final year of the community bond term (year 6). Interest payments will be made annually at 4%. Much of House of Friendship’s funding is contingent on their provision of certain services to the Waterloo region. Inability to meet these service provision targets could result in reduced funding, and may detrimentally effect bond interest and principal payments. ~30% of HoF’s funding is specific to addiction treatment, and is effectively the entire and only source of paying bond interest. Provincial funding for HoF has been stable for the past 10 years, and increasing over the past 5. It typically renews every 3-4 years, and the upcoming agreement covers until 2022. While there is a non-zero risk the service agreement will be drastically reduced, based on past trajectory and activities, this is not anticipated. The bonds are secured by the 562 Concession St. property. As of the last reported appraisal, which is prior to HoF’s acquisition, the property was valued at $1.28M. It is uncertain what the property value will be post renovation and addition, or at any future date. Additionally, the bonds are subordinate to the first mortgage on this property, in the event of a default. Changes in government policy and funding around the services provided by House of Friendship may adversely affect investor returns and principal payout. Loss of key personnel is an organizational risk and could have an adverse effect on House of Friendship’s ability to execute its strategy and provide services. Given the upcoming undertaking in facility renovation and construction, there is the risk of over-running budget and time to completion. House of Friendship’s Property Committee is overseeing and managing the construction project, with their in-house designer serving as “agent” to the construction company. John Neufeld is a respected and recognized community leader in Waterloo Region. As Executive Director for the past 9 years, John has led House of Friendship through a period of rapid growth. He is passionate about improving the way we serve individuals & families struggling with homelessness, hunger, mental health, addictions, and poverty. Together with an exceptional Leadership Team, House of Friendship’s Annual budget has doubled to $11M and annual donor investments have grown by 50%. John received the Top 40 Under 40 award in 2012 and was honoured with the Spirit of Community Award in 2018 through the United Way. He has an MBA (Wilfrid Laurier), MSW (Toronto), BA (Waterloo), and BTh (Canadian Mennonite University). He’s also completed Leadership Programs at Ivey (2013) & Rotman (2015). Margaret Lucas provides leadership to House of Friendship’s fundraising and marketing, applying her 14 years of corporate experience in marketing and business management. Along with her colleagues, they fundraise $1.4 million a year for operating, in addition to grants and bequests, and have recently completed a $2 capital campaign this past year. Transitioning from her role as Director of Marketing in the corporate sector, as Development Director she is passionate about providing generous community builders the opportunity to experience meaningful purpose in their giving and to know that they have left a lasting impact. Margaret holds an HBBA (Wilfrid Laurier University) and has completed the Leadership Program at Ivey Business School. Jackie Keller is a CPA with more than 15 years of experience in the public accounting and corporate sector. For the past 6 years, Jackie has transitioned her broad experience to the not-for-profit sector where she has been leading the Finance and IT teams at House of Friendship as Financial Director. Being passionate about financial stewardship and integrity, Jackie has been instrumental in ensuring House of Friendship has achieved a balanced budget for five consecutive years. Jackie holds an HBA (University of Waterloo) and MAcc (University of Waterloo) and has recently completed CPA Ontario’s Certificate in Not-For-Profit and Charity Finance Leadership.